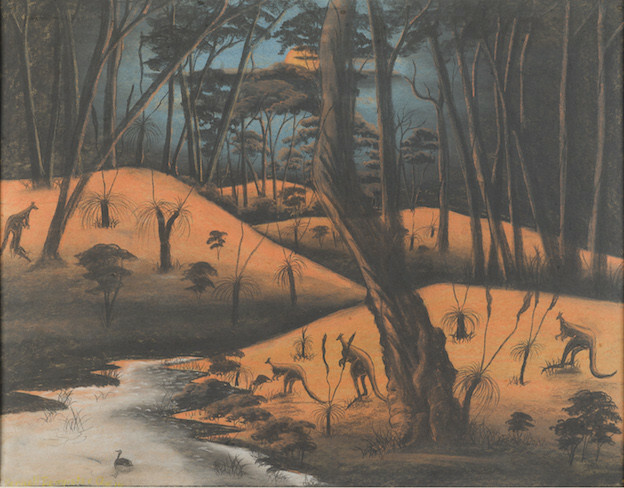 Parnell Dempster, 'Down to Drink,' c1949, Pastel on paper, 586mm x 764mm, The Curtin University Art Collection, The Herbert Mayer Collection of Carrolup Artwork. Although we can debate the historicization of literary modernism, particularly by attending to its formal rather than authorial delineations, it is less contestable to suggest that it had a prominent position in the cultural life of the 1930s. This was, of course, the decade of Pound’s Cantos, Beckett’s Murphy, Joyce’s Finnegan’s Wake, and Stein in America. Perhaps this canonized imperative declined somewhat in subsequent decades, but arguably it is not until the 1960s that we see modernism’s replacement in high culture; hence, Charles Olson’s letter to Bob Creeley about his generation being “postmodern.” The 1960s, of course, sees the flowering of a whole raft of poetries, not least among them ethnopoetics, with Jerome Rothenberg’s seminal Technicians of the Sacred being published in 1969. But what of the prehistory of the field of ethnopoetics?